The greens in this recipe are a perfect source of non-dairy calcium, protecting against osteoporosis. 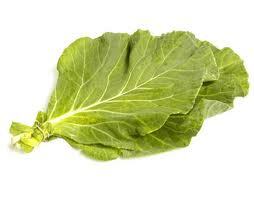 Collards are an excellent source of Vitamin A, C, and fiber. They help protect against cancer, heart disease, cataracts, and other diseases of aging through its antioxidant properties. These greens keep the immune system strong. Heat the ghee on medium heat in a large saucepan, add the chopped greens and chili (if using fresh) and saute on low heat for about 5-6 minutes. Now, add the water and spices, including chili, if using dry. Bring to boil on medium heat. Next, add the corn flour and simmer on low heat for about 4-5 minutes. Remove from heat and add the cilantro. Cover and let sit for five minutes. If using nutritional flakes, add now. Note: The greens are great blood purifiers and are full of calcium. Adding nutritional yeast supplies you with 18 amino acids, making it a complete protien, and with B Vitamins, which aid the body in managing stress levels. Do not eat more than 3 tbsp of nutritional yeast a day, as it creates excess uric acid in the bloodstream, which can tax the kidneys.